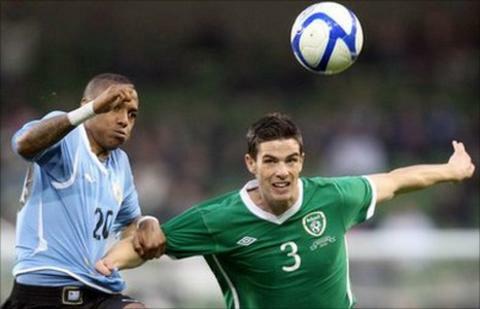 World Cup semi-finalists Uruguay beat a battling Republic of Ireland side in an entertaining friendly in Dublin. Sloppy defending allowed Diego Lugano to fire Uruguay ahead on 12 minutes but Shane Long headed the Republic level within three minutes. Edinson Cavani restored Uruguay's lead on 22 minutes and Abel Hernandez increased the advantage on 41. Keith Fahey notched a Republic penalty on 48 and Andy Keogh wasted a glorious late chance to equalise. Ireland manager Giovanni Trapattoni made eight changes from Saturday's Euro 2012 qualifier win over Macedonia, with senior players Richard Dunne, Kevin Kilbane, Damien Duff, Robbie Keane and the injured Kevin Doyle all missing. Stephen Kelly captained the Irish for the first time with Fahey getting a chance to impress in central midfield alongside Paul Green and Long a lone striker. Uruguay included Diego Forlan but Liverpool's Luis Suarez was not involved. After yet more angst about the Republic's lack of creativity in central midfield following the stuttering win over Macedonia, Birmingham's Fahey was getting the chance to show that he could be the answer to his side's problems. Wigan's James McCarthy was also in midfield after his brief appearance on Saturday had ensured the conclusion of the long-standing debate about his Republic allegiances. The Irish had an early scare as Forlan's ball over the defence found a charging Hernandez but the striker, after outpacing Darren O'Dea, blazed over. Uruguay keeper Fernando Muslera almost gifted the Republic the lead two minutes later but he was fortunate to divert Fahey's speculative free-kick onto the roof of the net. But the visitors did take the lead in the 12th minute as Fahey's failure to head clear Forlan's free-kick allowed skipper Lugano to fire past Keiren Westwood from close range. The lively opening continued as the Irish were quickly on terms with Long rising to head Liam Lawrence's superb cross past Muslera. More Irish pressure saw Fahey firing just wide but the Aviva Stadium was silenced again on 22 minutes as Maxi Pereira was allowed to cut inside from the right wing and find the unmarked Cavani, who curled in an accomplished finish from 10 yards. With the Irish defence looking decidedly shaky when dealing with either pace or balls over the top, Forlan missed another Uruguay chance in the 31st minute as he blasted over from just outside the box after a Hernandez nod-down. The visitors continued to make much of the running and Hernandez sent a curling effort just over after a powerful 38th-minute run. However, he made no mistake three minutes later when, after Alvaro Pereira had picked off Fahey's pass to Lawrence, he fed Maxi Pereria, who set up Hernandez to shoot past Westwood. The Republic were back in the contest three minutes after the break as Fahey coolly slotted a penalty after Martin Caceres had upended McCarthy. Long wasted a chance to level on 55 by blazing over after Muslera had failed to hold Andy Keogh's swerving effort. Westwood kept the Republic in the game with a brilliant double save to deny Cavani and Hernandez before the latter blazed over in the 70th minute after the Irish defence had again been cut open. However, Keogh missed a glorious chance to level on 80 minutes as he contrived to head wide from two yards out with the goal gaping after Muslera had yet again flapped hopelessly at a cross. Long's strength enabled him to fire in another dangerous cross two minutes later before the ball was cleared as Uruguay held on to take the win. Rep of Ireland: Westwood, Foley, O'Dea, Kelly, Clark (Delaney 75), Lawrence (McGeady 78), Green, Fahey (Gibson 66), Keogh (Stokes 85), McCarthy (Treacy 66), Long. Subs Not Used: Randolph, Forde. Uruguay: Muslera, Lugano, Godin, Caceres, Maxi Pereira, Arevalo Rios (Gargano 64), Perez (Scotti 90), Pereira, Hernandez (Eguren 84), Forlan, Cavani. Subs Not Used: Castillo, Fucile, Abreu, Gonzalez Luengo, Ramirez, Fernandez.